Welcome to the new Essiac NorthWest website. All of our high-quality herbs are grown in the US using organic methods. Most important our Essiac tea contains the "very essential" Sheep Sorrel root most brands lack due to the root being a rare commodity. We are a member of the Essiac Circle of Friends. Please visit our Essiac Circle website for more information about how we grow and harvest our herbs. We have been making some new changes in the website appearance, packaging and new contact information. We now offer 25% sheep sorrel root in our Extra-Strength Essiac Tea Herbs and continue to offer 10% sheep sorrel root. We are also offering new improved Extra-Strength Essiac Tea Herbs in one pound (16 ounces) pouches. Please visit our Shopping page for more information about our Special Blend Essiac Tea Herbs. Nurse Rene Caisse, who developed Essiac tea from a native American remedy for cancer, stated that Sheep Sorrel roots are "very essential" to the Essiac tea formula. 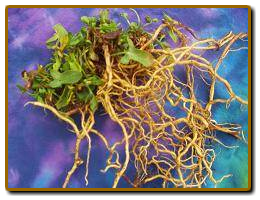 Unfortunately, high-quality, organically-grown Sheep Sorrel root is not readily available or easily found even on the internet. Also, any company can add a pinch of sheep sorrel roots to their tea and then can claim they have included sheep sorrel roots. However, such a small amount would not have a significant health benefit. It is vital that people know how much sheep sorrel root is in each packet since it is such an important ingredient in Essiac tea. Therefore, we offer a choice of Regular Strength Essiac Tea Herbs (10% sheep sorrel root) or our Extra-Strength Essiac Tea Herbs (25% sheep sorrel roots). The percentages given are the ratios by weight of sheep sorrel roots to the total sheep sorrel content in our Essiac tea. We do not diagnose nor treat any ailment as this should be done by a competent, experienced doctor of your choice or nutrition-oriented medical doctor who has personally examined you. Every individual's body has specific requirements for nutrition. The information offered on this web site is for historical and general information and shall not to be construed as medical advice or treatment. The use of herbs and other natural remedies is a God given & natural right. We assert that each individual human being owns his or her own body and no government or medical institution has the right to usurp that ownership. No mere statute or regulation can take away a human right. THEREFORE, all Natural, Human Rights and Freedoms are hereby secured and preserved, any and all mere de facto political laws, codes, regulations, statutes, administrative procedures, government alphabet agencies and/or United Nations treaties to the contrary notwithstanding. Nothing on this web site shall be construed as legal or medical advice or treatment. For legal or medical advice please bend over and consult a qualified, licensed profe$$ional.